Forgotten Bookmarks: Are Those Fries In Your Pocket? Color photo, 4 inches by 6 inches. Is it me, or does it look like a handful of french fries in this guy's pocket? 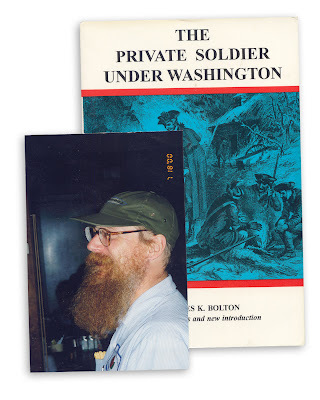 Found in "The Private Soldier Under Washington" by Charles K. Bolton. Published by Corner House, 1997. Oh my gosh.... Those are almost definately french fries. This reminds me of my opa. He has a beard like that, only white, and keeps unusual foodstuffs in unusual places.